This post is coming from a quaint little restaurant at the base of the church in St-Emilion. The weather is a stunning cloudless 27c and for mid-May one cannot ask for more. This is the first of a few posts for 2012 Bordeaux Wine Week. Today we will be stopping at a few Chateaux in the St-Emilion region. Emilion is my favorite region in Bordeaux and is also the only region to have it’s very own classification system, separate from the Bordeaux system. Of note as well is the entire jurisdiction has a UNESCO world heritage designation. 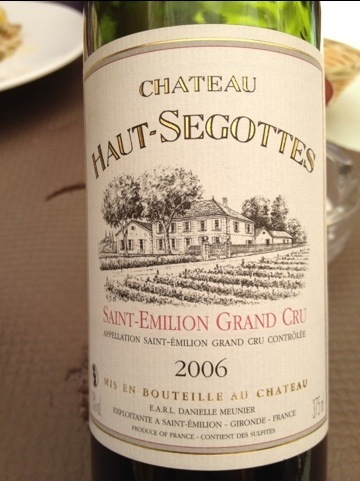 We are just finishing off a demi of 2006 Chateau Haut-Segotes, a Grand Cru. Bold tannins and deep fruit indicate that this wine is still a tad young, but is was overall excellent. Good day so far, more to come! This entry was posted in Bordeaux, Wine and tagged Bordeaux, st-emilion. Bookmark the permalink.